We have prepared this one-day wine tasting and antiquities tour of Pompeii from Naples for those looking for a luxurious and slightly more unusual excursion. You will visit a winery on Mount Vesuvius, and explore the highlights of fascinating Pompeii with a private art guide. By the end of the day, you will have learned all about how the Ancient Romans wines and dined. The tour begins when you are picked up at your Naples (or Amalfi Coast) hotel. Head towards the mythical Mount Vesuvius! Visit a winery whose grapes are harvested on the volcano. 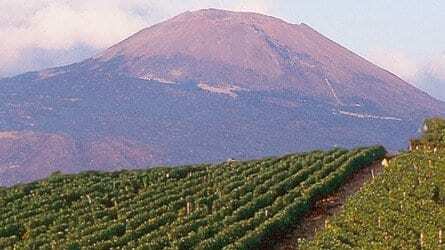 As in Sicily’s fashionable Mount Etna wine country, Campania’s Mount Vesuvio is an up and coming winemaking area. The fertile volcanic soils have been appreciated since ancient times and winemakers like Gabriele De Falco (who worked for years at the acclaimed Feudi di San Gregorio estate) are making some fabulously unique wines in the Lacryma Christi del Vesuvio appellation. After wine tasting, you will head for a tasting menu wine lunch at a Michelin starred restaurant, enjoy! The cuisine of Campania is tantalizing and you will taste local products like just-made buffalo mozzarella from Paestum and San Marzano tomatoes. In the late afternoon, you will visit the archeological site of Pompeii. What a captivating place to visit, even for non-history buffs! You will gain an often-funny insight into Roman everyday life, from the local bar to the bakery to the brothel. Your private guided tour of Pompeii will last about two and a half hours and a special focus will be placed on the references in the excavation site to food and wine. And finally, in the evening you will be dropped off at your hotel in Naples after an unforgettable day. 9 a.m. You will be collected from your hotel in Naples by your elegant chauffeur and luxury Mercedes, and you will head for a volcanic vineyard! Visit one of the most prestigious wineries in the region like De Falco, taking in a volcanic vineyard walk and of course a tasting of the winery’s best wines. Carry on to a stellar five-course lunch, all paired with wonderful wines made with local grapes such as the fresh and aromatic white Falanghina and the rich, red Aglianico. After your elegant lunch, you will enjoy a digestive walk amid the excavations at Pompeii. In the year A.D. 79, Mount Vesuvius erupted and Pompeii was buried under six meters of ash and rock (the equivalent of a two-story building), and it lay beneath the hardened earth for centuries undiscovered. In 1748, under the Bourbon king Charles III (also king of Spain), the first excavation was carried out. This king also built the beautiful archaeological museum in Naples to house the treasures. You will have your own private art guide to show you the highlights and make the life of the Ancient Romans come alive. In the early evening, you will be driven back to your hotel in Naples where you will be dropped off, but not before receiving a special wine gift.